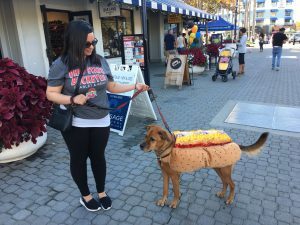 Oakland, Calif. – October 24, 2018: Jack London Square is opening the waterfront Saturday to puppies and pooches, as well as their owners, for free Halloween festivities. This is the fourth annual Boo! Bark, Brews + Bites. More than 7,000 visitors are expected to attend with their four-legged friends to delight in music, tricks and frights from 11 a.m. to 4 p.m.
Attendees will be offered crafts for people and pooches, doggy treats, photo booths, pet pampering, pet tricks and a canine costume contest. This celebration of pets raises awareness and serves as a fundraiser for the non-profit Canine Companions for Independence (CCI). CCI trains assistance dogs for kids and adults with disabilities, free of charge. Graduates who have taken the course will speak at the event and provide assistance-dog demonstrations. 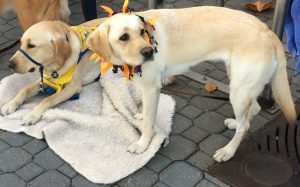 There is no admission fee, but donations can be made at http://www.cci.org/dogfestbayarea. CCI is cohosting the annual DogFest Walk n' Roll Bay Area simultaneously with the waterfront activities. 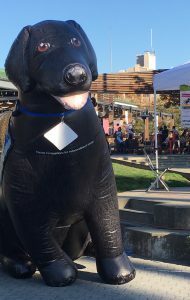 DogFest Walk 'n Roll is a pet and family-friendly quarter mile walk at Jack London Square. Food and beverage will be available for purchase. Pets are welcome year-round at all Jack London Square restaurants with outdoor dining. Please go here to see all activities offered at the Oakland waterfront or call (510) 645-9292. Transportation options to the Square include the Alameda/SF Bay Ferry, public transit, biking, walking and driving. For directions to Jack London Square, please go here.